Never before has Australia enjoyed such economic, commercial, diplomatic and cultural clout. Its recession-proof economy is the envy of the world. It's the planet's great lifestyle superpower. Its artistic exports win unprecedented acclaim. But never before has its politics been so brutal, narrow and facile, as well as being such a global laughing stock. A positive national story is at odds with a deeply unattractive Canberra story. 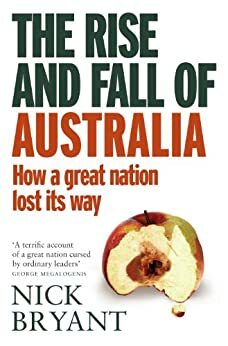 The country should be enjoying The Australian Moment, so vividly described by the best-selling author George Megalogenis. But that description may turn out to be inadvertently precise. It could end up being just that: a fleeting moment. At present the country seems to be in speedy regression, with the nation's leaders, on both sides, mired in relatively small problems, such as the arrival of boat people, rather than mapping out a larger and more inspiring national future. In The Rise and Fall of Australia, BBC correspondent and author Nick Bryant offers an outsider's take on the great paradox of modern-day Australian life: of how the country has got richer at a time when its politics have become more impoverished. In this thoroughly entertaining and thought-provoking book, dealing with politics, racism, sexism, the country's place in the region and the world, culture and sport, the author argues that Australia needs to discard the out-dated language used to describe itself, to push back against Lucky Country thinking, to celebrate how the cultural creep has replaced the cultural cringe and to stop negatively typecasting itself. Rejecting most of the national stereotypes, Nick Bryant sets out to describe the new Australia rather than the mythic country so often misunderstood not just by foreigners but Australians themselves.